Following the completion of the magnificent historic bay window as featured in our main website, we have just completed the installation of 'The Rolph Window' at Allerton Castle. 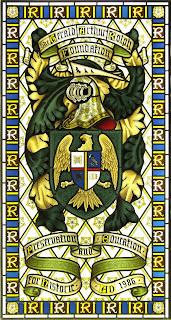 Dr Rolph has presided over the restoration of this magnificent building for more than two decades, and in keeping with heraldic traditions, this window commemmorates the history of the Rolph family tree, including elements relating to the castle itself. Apart from the technical and artistic demands, this window required a lot of research and design, and we learned a lot about heraldry. Although the refurbishment was completed over a year ago (see feature in our main website) the original budget did not run to a full restoration, and there are still some areas with very suspect glazing. One such area is the transom windows adjacent to the disabled access, which we have replaced with art nouveau leaded lights as shown. Hopefully the restoration will continue as funds become available.